The unique Boydel Electro Chemical Reactor (ECR) module is a treatment technology that combines electrocoagulation and advanced oxidation within the same sealed reactor; creating very impressive new water cleaning and disinfecting capabilities. The CFECT™ process operates on a continuous, flow-through basis, for the feedstock, the cleaned effluent, and lastly the wet sludge being captured and removed in our proprietary dual cone clarifier (DCCL). The sludge is ready to be continuously delivered straight from the top of the DCCL to a rolling belt press, and final disposal at typically 15-18% dry consistency. Higher sludge drying levels, as desired, are readilly available with alternate "off the shelf" higher performance dewater equipment supplied by multiple vendors. The ECR module includes a Titanium body substrate supplied with internal nano-coatings designed to produce the best chemical catalyst reactions for any given feedstock. Especially beneficial, the Boydel process requires no secondary and dangerous chemical handling or purchases for disinfection and oxidation purposes. All oxidizing is accomplished insitu, as the CFECT process develops Hydrogen Peroxide (H2O2), which then allows for the potential to create a powerful Fenton's like reaction and a large or small chlorine residual depending on our custom selection of catalytic nano type coatings and ECR PLC operating parameters. The CFECT system utilizes a trace amount of water treatment class polymer; typically under 8kg of dry polymer per day at 1,000,000 lpd flows, for both the water processing itself and sludge thickening. Trace NACL dosing (at a level most people cannot taste in fresh water) may be required in feedstock situations where sufficient insitu conductivity is not available. Lastly, as a fully enclosed in-tank and vessel non-aeration system, the WaterMiner CFECT process is essentially odourless and silent. The Boydel ECR is unique in that it is a "close gap" reactor meaning that we can clean water in 15 minutes, utilizing voltages that are lower than a car battery. This adds substantial operator safety compared to other conventional electrocagulation processes which operate at much higher and potentially harmful level voltages. Further, our ECR unit has a PLC controlled gap mechanism that maintains this perfect "close-gap" benefit through the complete useable life of the dissolving sacrificial anode; which can be either iron, aluminum or other alloys. ECR polymer & sacrificial Iron / Aluminium is supplied and included in Boydel's, Smart Support Services Program (B3SP), in a simple cost effective per M3 fee. Meaning among other things, your technology support, training, ordering and main consumables costs are managed, predictable. and stable. Ask us about all the benefits of the B3SP program. ECR direct power consumption on the order of 1,5 to 2.5 kWh/m3 depending on feedstock realities and discharge requirements. NACL brine if needed for conductivity boost would be additional. What are the operator considerations? 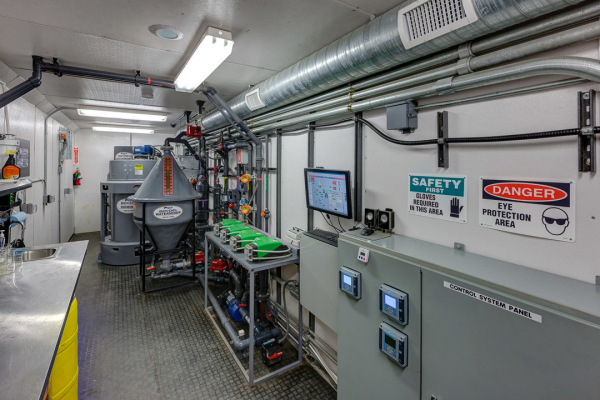 With the exception of the Boydel ECR module and the DCCL clarifier every component in a CFECT platform is "off-the-shelf" standard waste water treatment plant equipment and will recognized by every certified WWTP operator. There are no daily maintenance issues for the ECR module. The ECR single sacrificial anode in the electrocoagulation zone will need to be replaced in a one hour change out procedure, approximately every 4 - 6 weeks depending on the contaminant loading of the feedstock being processed. Except for cleaning the floc sight window on the DCCL module there is no daily maintenance. "Capacity and Compliance Enhancement Program"
CONTACT US TO EXPLORE AND BOOK A ZERO RISK PILOT TO YOUR COMMUNITY OR COMPANY, ONSITE WATERMINER COMMERCIAL SCALE DEMONSTRATION PROJECT AT YOUR FACILITY. IF WE BRING YOUR PLANT TO DISCHARGE COMPLIANCE YOU WILL ENTER IN TO A CONTRACT OF SALE, LEASE OR FEE-FOR-SERVICE. IF BOYDEL DOES NOT BRING YOUR PLANT TO DISCHARGE COMPLIANCE, WE DE-MOB FROM YOUR SITE WITHOUT COST TO YOU. TO BOOK A PILOT PROJECT CONTACT US ON OUR CONTACT PAGE FOLLOWING. *Our CEO or President will respond to your enquiry within 24 hours. Easily add cleaning performance and years to a contaminant, or hydraulic flow, challenged WWTP. 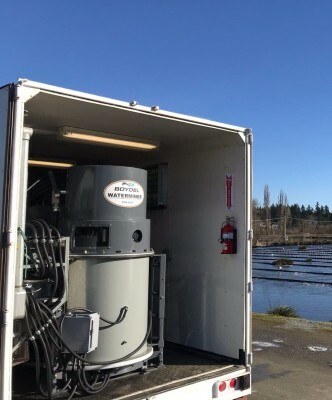 Boydel will install our trailer mount demonstration package in front of a current facility and remove a portion of the problematic flow, which will be pre-treated by the WaterMiner. The then cleaned WaterMiner effluent will be discharged back into a certified WWTP plant influent line, reducing the solids workload, reducing risk and helping stabilize the downstream process. Alternatively; if it is a hydraulic loading issue as well as solids loading problem, then we will fully treat and fully bypass the plant for direct discharge to our BioMiner tertiary treatment polish modules, and finally to the existing WWTP final polishing stage. "Interested Party", technology use and testing programme. purchase access to both of Boydel's lab scale LMC-BT (top) and full LMC (bottom) containerized CFECT™ equipment platforms. 6 month territory or market lock-ups as you explore your specific WaterMiner business case potential. We are able to move very quickly, and with the right Interested Parties we will do so.